Here’s a fun article we wrote for our Flea Market Gold column in Create & Decorate magazine. It is really getting us in the mood for summer! And going to the flea market! 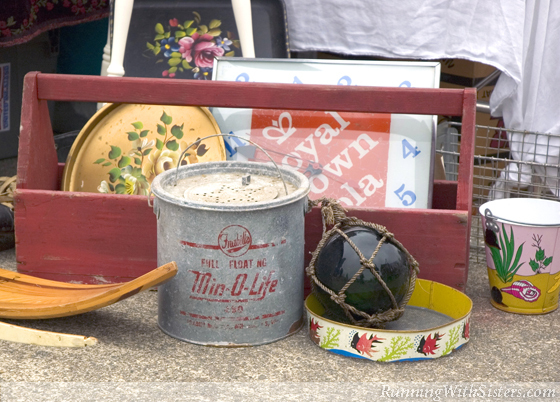 It’s summertime and the shores of the flea market are awash with seaside treasures! Vendors wait all year to haul out their beachy bounty, from life preservers and crab trap buoys to abalone shells and coral. So on this trip to the flea market, we were on a quest to help transform a friend’s guestroom into a breezy coastal retreat. 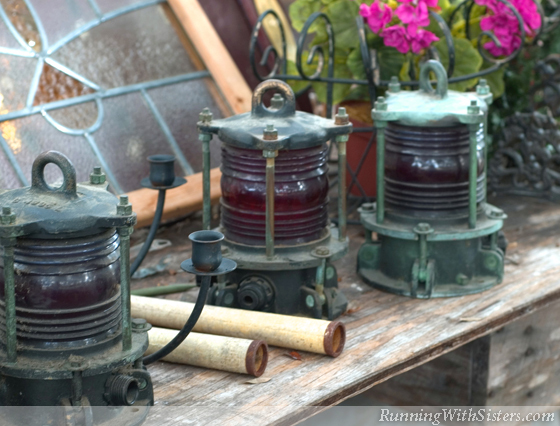 Kitty was looking for a few authentic ship lanterns with red glass and a pretty patina that would be handsome on the bedside tables. Maritime artifacts like these go for hundreds at auction, so she was happy to find a pair for only $50! As we ventured on, we spotted a weathered “Private Beach” sign that would add a whimsical touch to our island look. A galvanized bait bucket caught Jennifer’s eye. She thought it would make a clever storage container, and at $24 it was a steal. The find of the day was a collectible sand pail in near-mint condition. Lithographed, children’s beach buckets like this one are often scratched and dented after years of sandcastle making, but this particular pail looked like it had never seen the sun! 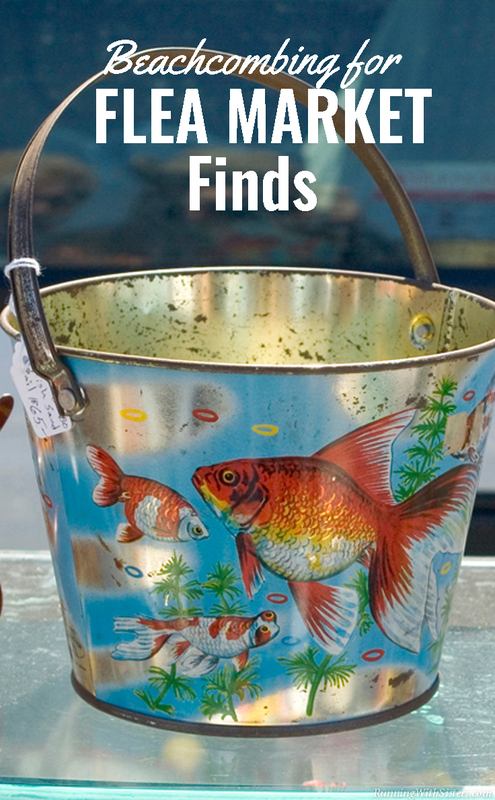 This vibrant goldfish pail would probably sell for over $100 online, so we paid the $65 asking price and saved our haggling skills for another day. 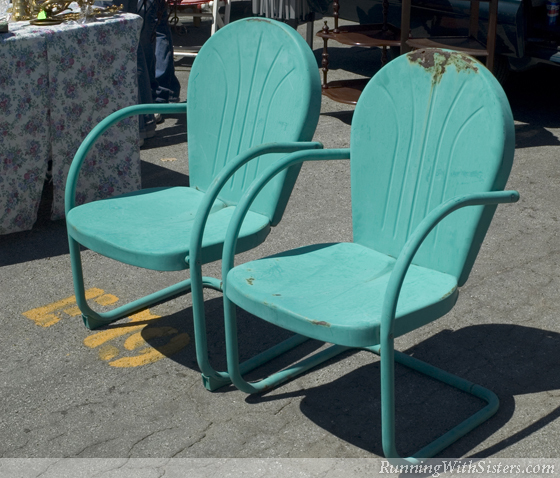 Scalloped, metal lawn chairs from the fifties (sometimes called “motel bouncers”) are as popular as ever and can cost over $100 in the real world. Fortunately, these classics are regulars at the flea market and go for a fraction of the antique store price. Old metal chairs are great makeover candidates if they don’t have too much rust. Just sand any rusty spots, wash and dry the chairs thoroughly, and then give them a coat of fresh spray paint. We found a pair of these chairs for only $30! They’ll be stylish with a coat of Krylon’s Blue Ocean Breeze and cabana-striped cotton throw pillows. 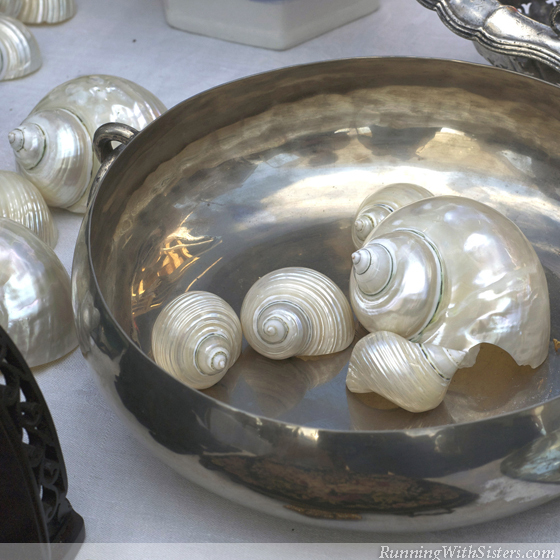 The perfect finishing touch for a beach retreat has got to be seashells, so stock up on these natural home accents. Look for colorful, affordable shells like speckled sea snails or lion’s paw scallops to display in an apothecary jar. Starfish, sand dollars, and sea urchins make attractive objets d’art for only $5 each, and those you find at the flea market will have lost their fishy smell! An abalone shell with its mother-of-pearl finish makes a naturally glamorous soap dish. Spectacular finds like a sea fan ($5 to $15) or a nautilus shell ($15 to $30) can stand alone as amazing organic pieces of art. And look for peachy, king-sized conchs, which run between $10 and $20 each–they make dramatic bookends. Glass fishing floats in blue-green and aqua evoke that ocean feeling in any room. 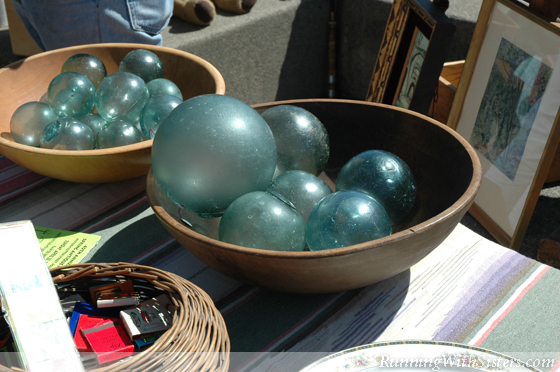 These vintage glass buoys are still washing up on the shores of the Pacific Northwest. Baseball-sized floats sell for between $10 to $15, and larger grapefruit sized floats go for $15 to $20. Genuine floats are hand-blown, have bubbles in the glass, and have no seam. Authentic glass floats should also show serious signs of wear and tear–after all, that breakable buoy has been battered by the waves for who knows how long. Plus, the frosted effect is beautiful!